On November 9, I woke up to a new world—a world that seemed more uncertain, more dangerous, and more hostile to logic and facts than existed just a few hours before. I’m referring, of course, to the recent U.S. presidential election. What this change in administration means for those of us in science is unclear. But many in the scientific community are worried about their jobs, their research funding, science literacy, the environment, and many other things. It’s taken me several days of reading and thinking about the potential impact of the election on science to get to a point where I can move forward. 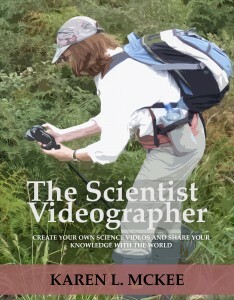 In this post, I’d like to offer some thoughts about moving forward and emphasize the role of video as a powerful tool for scientists to communicate about the important work they do. Since I started this blog in 2012, I’ve written about many aspects of video-making and why video is so effective as a communication medium. I feel now, more than ever, that the scientific community need to make their voices heard; and they need to use 21st century communication tools such as video and social media if they want to reach beyond their ivory towers…and be heard. For me, perhaps the most disturbing aspect of the campaign rhetoric was the way in which facts were ignored and conspiracy theories were embraced. When science was mentioned, it seemed that opinions based on falsehoods were accepted as facts, and facts (climate change, for example) were dismissed as hoaxes. This, despite all the efforts of government science agencies, science societies, and individual scientists to debunk false claims about climate, vaccines, evolution, and other politicized topics and to communicate the importance of credible science to society. Just as disturbing is the message these actions send about how the scientific community may be viewed in the future. Scientists have traditionally been viewed by the American public as trustworthy (4 in 10 Americans express a high degree of confidence in the scientific community) and the scientific enterprise as essential to society (9 in 10 Americans agree that science and technology will create more opportunities for future generations) (NSF Science and Engineering Indicators 2016). But when our country’s leaders dismiss credible scientific evidence in favor of quackery, they are signaling that the sources of that evidence (scientists) are not to be trusted and that science is not important to the future of the country. The scientific community will face some big challenges in the next few years—not the least of which will be countering anti-science and pseudo-science movements, which will be emboldened by the outcome of the election. We’ve already seen the rise of fake news sites on Facebook, with speculations about how they may have influenced the election. The public engagement with false stories on Facebook skyrocketed during the latter months of the campaign. Fake news reported on sites that made up stories about the candidates (e.g., the Pope endorsed Trump; Clinton sold arms to ISIS) outperformed real news. Such movements are fed by the larger political culture in which debate is won not by the facts, but by appeals to emotion. Factual rebuttals are ignored, while falsehoods are repeated ad nauseam. This cultural shift has prompted the coining of new words that encapsulate the way “truth” is viewed. For example, the Oxford Dictionary has just announced its word of the year: post-truth, which means “as relating to or denoting circumstances in which objective facts are less influential in shaping public opinion than appeals to emotion or personal belief”. As explained on the dictionary’s website, the “post” part of the term doesn’t mean “after an event” such as in post-war, but instead refers to a time when the concept is no longer relevant. In this case, the concept that is no longer relevant is the truth. Stephen Colbert had earlier introduced a word with a similar focus: truthiness (defined as ‘the quality of seeming or being felt to be true, even if not necessarily true’). These new words illuminate a disturbing phenomenon, on broad display during the campaign—one that scientists (and science communicators) will find difficult to counter. I say difficult because what scientists deal in is the truth, and they are flummoxed when scientific facts are ignored in favor of myths or when the honesty of science practitioners is questioned. How do you counter someone who refuses to acknowledge hard facts or who questions the motivations of scientists? One response to expressions of disbelief in scientific evidence is to double down on the facts and data, as if more scientific evidence will shatter misguided opinions. However, that knee-jerk reaction doesn’t work. This deficit model of science communication has been mostly discredited as ineffective (i.e., giving people more information does not necessarily change their minds). Credible scientific data will influence only those who are receptive to it (and seek it out); however, scientific evidence alone won’t budge those who are emotionally tied to a particular position. If people are unswayed by facts, then scientists and science communicators must pay attention to people’s opinions and attitudes about scientific topics. This idea is not new, of course. Science communicators have been saying for some time that it’s important to do more than just inform; it’s necessary to engage people emotionally and on a personal level. That doesn’t mean abandoning scientific evidence….it means developing messages that resonate with people on an emotional or personal level. We clearly need to continue explaining science to the public, but in a way that captures people’s attention, acknowledges their concerns and personal beliefs, and sustains the public trust in the scientific enterprise. Science agencies, societies, and organizations must continue to serve as clearing houses for objective science information and continue to challenge claims unsupported by scientific data. But what can you, an individual science professional, do? One way you can help is to tell your story about how you conduct science or why you think your work is important to society as a whole. By telling stories, you can help the average person, who has never met a scientist, understand what we do and why we do it. Most scientists are hard-working, dedicated people who are passionate about their work. Their stories are rarely heard by the general public, though, but they would go a long way toward putting a human face on science and making an emotional connection. There are many ways to tell your story. You can write about your desire to protect our natural resources or to find a cure for a deadly disease and post it on your website, on LinkedIn, or on a social media outlet. Or you can film yourself doing field research in a rainforest or conducting an experiment in your laboratory and explain what motivated you to study that particular subject. These don’t have to be full-blown memoirs or documentaries. A short blog post on Facebook or LinkedIn can convey a lot about you and your scientific passions. An increasing number of scientists and science students are sharing their research with Tweets, sometimes accompanied by a video clip. Such brief messages require little time to craft and post. A video clip attached to a Tweet can show the organism or habitat you are studying or illustrate how and where scientists work. The point is to convey information about science and scientists without lecturing or challenging people’s personal beliefs. People don’t like to be lectured or to feel they are being talked down to or that their strongly-held beliefs are being questioned. Instead, show that you are excited to share your science with them….that you want them to share in the joy you felt when you discovered a new species, for example, or developed a new test to detect a deadly disease. Find common concerns between you and your potential audience and make the point that you are both seeking the same outcome (food security, better medical treatments, stronger economy, more jobs, cleaner environment). Then you can explain how your science will help make that happen. In telling your story, don’t be afraid to show your enthusiasm, curiosity, determination, or excitement about your research. Even if they question your scientific conclusion, they will appreciate your passion for your work and the integrity with which you conducted it. Share your joy about doing science. Describe what you like most about being a scientist or your particular science discipline. Talk about a challenge that you faced and how you overcame it. Describe a failure and what you learned from it. Show where you work (laboratory or field) and explain what you like about it. Demonstrate your passion for your scientific topic and why you think it is important. Describe how your curiosity led you to a discovery. Talk about scientific integrity and how you strive to avoid bias. Point out the challenge of finding sufficient funding to conduct your research. Show how your research is helping a local community cope with a health or environmental issue. Have citizens, resource managers, farmers, doctors, or other end users of science information describe the importance of your research to them. I think that one of the best ways to engage people is through the use of video. With video, you can more easily reach people who don’t have the time or patience to read a long essay. You can also more easily show your passion or other motivating force in a video. Yes, you can write about how passionate you are about coral reefs or mangrove forests, but actually seeing and hearing you express your feelings is much more effective and memorable. By showing your human side, you will automatically connect with people. By describing your successes and failures or what drives you to spend 12 hour days in the laboratory, you appeal to people’s fundamental emotions. People will recognize that you are not the arrogant know-it-all that they expected. When you develop a rapport with people, they become more receptive to your science information. And many people are now looking for science information in the form of video; YouTube is touted as the second largest search engine. Why not take advantage of this trend? The above video provides a glimpse into how scientists formulate a scientific question, design a study to answer the question, and then to conduct the study and analyze the results. This information is provided in a way that is interesting and personable and makes the point that scientists are driven by a strong sense of curiosity and a desire to understand how the world works. There are many other great examples of videos that explain science, celebrate science, and defend science. Most are freely accessible on media-sharing sites and generally explain science in a way that the average person can understand. As I’ve tried to convey on this blog and website, making a video is no longer something only professional filmmakers can do. Anyone with a smartphone and an inexpensive movie-editing app can create an effective and compelling video. I hope more science professionals take advantage of these and other technologies to share their knowledge with the world. If you’re like me, you’ll be glad when this year comes to an end. It’s been stressful, to say the least, especially the past two weeks since the election. But where do we go from here? Those of us in science know how important the scientific enterprise is to our personal health, our environment, our economy, and our way of life. However, we’ve not done a great job of sharing our science with those outside the scientific community or explaining why science is important to society. This situation is slowly changing, but there remains a lot of resistance. I’m repeatedly told by colleagues that they don’t have time or they don’t see the benefit of communicating beyond the traditional outlets of science journals and conferences. They also express disinterest in using social media. I think it’s becoming clearer to everyone, though, why we should be concerned with informing and engaging the public, the media, and policy-makers. To avoid feeling helpless in the face of uncertainty, I’ve tried to think of positive ways to move forward. Writing this blog post has helped me process some of the things that bothered me about the campaign and to think about ways to help fellow scientists who are wondering what they can do. I think that by simply telling our stories as scientists, we can begin (or continue) a conversation with the public. By showing our humanity, we send the message that we are not all that different…that we have similar concerns and questions about the world and are seeking ways to make the planet better for everyone. Communicating effectively is not easy, however. If you are considering engaging the public, sharing your experiences as a scientist through social media or on media-sharing platforms is a great way to get started. More information about and tools for communicating can be found at the AAAS Center for Public Engagement with Science and Technology.